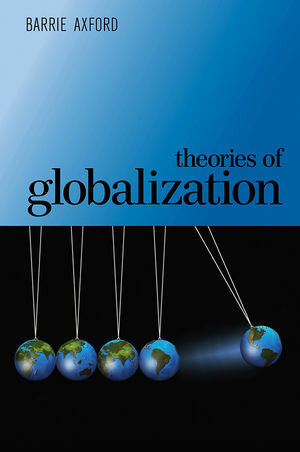 Theories of Globalization offers students and scholars a comprehensive and critical introduction to the concept of globalization. Barrie Axford expertly guides readers through the full range of perspectives on the topic, from international political economy to geography, global anthropology to cultural and communication studies. In so doing he draws out the common threads between competing theories, as well as pinpointing the problems that challenge our understanding of globalization. Key terms such as 'globalism' and 'globality' are carefully explained and central themes like capitalism, governance, culture and history explored in full. In assessing the contribution made by globalization theory, Axford's account also sheds new light on several crucial current issues. These range from the changing shape of democracy and citizen engagement with governance, to issues surrounding 'just war' and humane intervention, and problems relating to empire and post-colonialism. This wide-ranging and detailed new book will be essential reading for students and scholars of international politics, sociology and any area where the concept of globalization is discussed and disputed. "Barrie Axfords Theories of Globalization makes a welcome addition to the bookshelves of those interested in globality, globalism, and globalization." "This impressive and wide-ranging text provides a valuable survey of some of the most influential intellectual debates about contemporary globalization." "Barrie Axford has produced a truly outstanding interrogation of the vast array of theories of - and approaches to - globalization and globality. Adopting a cross-disciplinary stance, he has compiled a volume that is both even-handed and, in the best sense, critical. Axford is to be congratulated for his insightfulness, comprehensiveness and, indeed, wisdom." "Barrie Axford's comprehensive book should be part of every university library."